One of the earliest photos of myself has me in a pair of diapers gnawing on a baked pig tail with my teethless gums. In the mountains of West Virginia, pork was a staple of our daily diet and the holy grail of this diet were the pig’s tail and feet. Hogs were a mountain favorite for many reasons; notably, they could be “turn’t loose’t” in the mountains in the springtime and in the fall they could be rounded up and butchered on a cold day. Not that this Appalachian practice was without controversy, i.e. see the Hatfield & McCoys; however, for many decades “hog killing” served as one of the most community-oriented annual activities to take place at the head of each holler. Unfortunately for us, pigs only had one tail and so the opportunity to eat their tails was a rare treat and a mountain delicacy for our ever growing coal mining family. On the other hand, for every tail we had stashed away, there were four feet we were treated to enjoy. Unlike many other people who would pickle their’s, my father would bake our pork feet, as well as the tails. Once fully baked, the outside would form a hard, crackly shell which tasted much like a pork rind, while the inside contained a gem of meat. After they were baked and ready to eat, we would salt them heavily and then proceed to eat them with a fork and a knife… My blood pressure is rising off the charts just thinking about eating them! 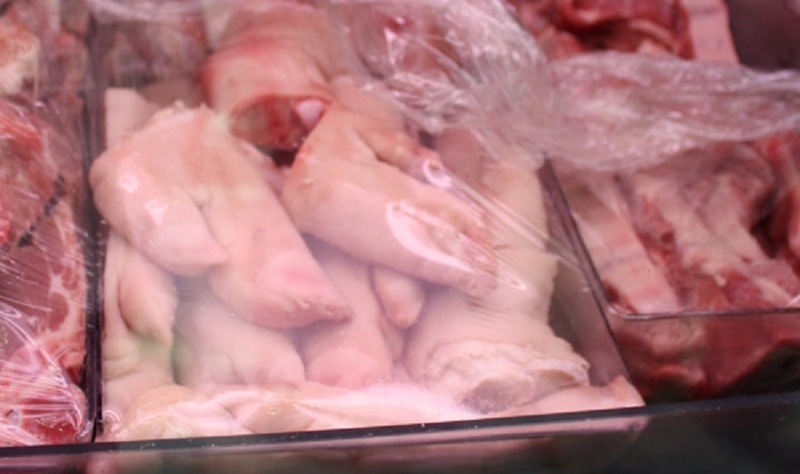 I never realized this was even looked down upon or even unusual until I moved out of the mountains and soon realized that finding anyone who even knew the pig’s feet could be eaten was a rarity, let alone finding someone who ate them regularly. To some, the notion of eating a pig’s tail or feet is gross, but to me, this is a precious memory and one that I cherish deeply. Never got to try this because my mother always pickled those parts. Now I wish I could have tried that. However, Mother always cleaned the chicken feet, cooked them and made a delicious gravy. I also did that when I had my own family. After we left the farm and moved to town my teenage son (who loved the chicken feet and gravy dish) mentioned it to some other guys when they were talking about food. They laughed at him and made fun of him and asked him if we were so poor we had to eat chicken feet. I told him to just not talk to those “city” kids about what we did on the farm, since they so obviously knew nothing about farm livin’.